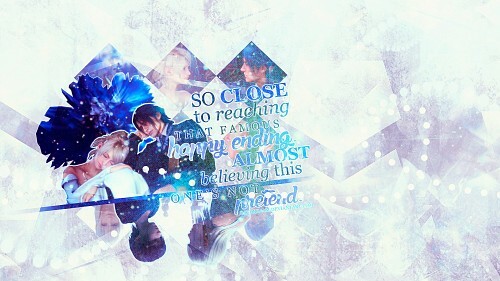 Final Fantasy XV Wallpaper: That Famous Happy Ending. Minitokyo »	Final Fantasy XV Wallpapers » Final Fantasy XV Wallpaper: That Famous Happy Ending. [<b]So close to reaching that famous happy ending~ Jon McLaughlin. Credits: http://xnienke.deviantart.com/, http://carllton.deviantart.com/, http://dastardly-icons.deviantart.com/, and http://www.dafont.com/. Browse Final Fantasy XV Gallery: Recent | Popular.